LynchyRightNow: Here Comes October Baseball . . Here Comes October Baseball . .
You want story lines? October baseball has all the story lines you need. Before we get to that, lets have a moment of silence for the streak that was 13 consecutive postseasons with the New York Yankees . . . . DONE! Pinstripes OUT, October in St. Pete, IN. While were on the subject; The franchise that never won more than 71 games in a single season will be hosting playoff baseball games come October. The Tampa Bay Rays will most likely hoist their first ever American League East crown and finish with 95+ wins. A year ago today these Rays sat 28 games out of first place and boasted the worst record (64-92) in the entire Major Leagues. Today, the Rays are 95-62, only the Angels and Cubs have better overall records. Rays manager, Joe Maddon, is a lock for manager of the year. All-Star third baseman, Evan Longoria, has hit 25 homeruns and drove in 82 runs in just his rookie season, a lock for rookie of the year. Pitching is what wins in the postseason, during the regular season you can out score a team, dig into the back end of their rotation and win a few games. The Rays staff includes FIVE guys who have started 25+ games and banked at least 11+ wins. Not only does this staff get wins, three of their five starters (Kazmir, Garza, and Shields) boast sub 4.00 era's. Andy Sonnanstine, whose ERA is highest among Rays starters, has allowed just 8 runs in four starts in the month of September, twice starting games in which the Rays got huge wins against the rival Red Sox. This team may not have the postseason experience of the Red Sox, Angels, and White Sox, but they've never battled for a division championship and they did that well for the first time. "We're in the playoffs, and everybody knows how dangerous we are in the playoffs"
The Red Sox, led by reigning rookie of the year and MVP candidate, Dustin Pedroia, are a different team than they were in past championship seasons. Gone are the days of a mashing middle of the order with Ramirez and Ortiz, gone are the days of brash front running aces of the rotation like Pedro and Schilling. 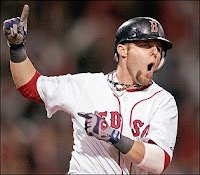 These Red Sox move runners along with hitters like Pedroia and Youkilis, who can hit for average (Pedroia @ .324, Youk @ .314), for power (Pedroia 17HR, Youk 27HR), and drive runners in (Pedroia 82 RBI, Youk 111 RBI). The '08 Red Sox steal bases, when is the last time we saw a slugging Sox team that could steal bases? The 117 bags stolen is good for 7th in the Majors and 3rd in the American League, led by Jacoby Ellsbury with 49 and Coco Crips with 20. With the left handed Jon Lester having a phenominal season (15-6) with a 3.26 era, and fellow starter, Daisuke Matsuzaka winning 18 of his 29 starts combined with his 2.80 era (good for second among AL starters) the Red Sox are going into the post season with a strong rotation. Did I forget to mention they have the most dominant post season pitcher in the game, Josh Beckett, in their arsenal? Consider it mentioned. This team has owned the Angels in the post season, they have world series MVP's in Mike Lowell (2007) and Josh Beckett (2003), and more importantly they have won it as a Wild Card and won it as a Division Champ. Can the Boston Red Sox go back-2-back, and complete what it takes to be called a dynasty? Does it matter if the Brewers or Mets make it to October? Currently, one game seperates the New York Mets and Milwaukee Brewers for a playoff berth as the National League Wild Card. The truth is, it doesn't matter which team gets in the playoffs. The Milwaukee Brewers don't have a bullpen and to say that the Mets pen is soft, is in an understatement. In the most crucial portion of the season, September, the Mets are 11-9, losing 6 of their last 10 games. The Brewers are even worse, going 6-15 over that same time period. With Mets closer Billy Wagner on the shelf for more than a season, there is no way this team can finish games. In their rotation, it doesn't get much better. With Pedro's era climbing over 5.00 in just 19 starts and the tandom of Oliver Perez/John Maine having era's over 4.00, the Mets don't have many options. Unless Johan Santana plans on pitching 9 innings every outing (already pitched over 225 on the season) the Mets have no shot in the playoffs. The Brewers? Twelve days left in the season, in the middle of a playoff hunt, and they fire their manager? The replacement, Dale "Send 'em in" Sveum. Not only that, but do you know who's in their bullpen? ERIC GAGNE! Proven steroid user, stole a World Series ring with the Red Sox in '07, and has an ERA north of 5.50!!! Ben Sheets can't stay healthy, C.C. would be pitching on the road if they got in, and who else are you planning on taking the ball, Jeff Suppan and his 5.06 era? Even if C.C. takes the ball every game, ask the Indians how he did in the postseason in 2007? I've got an idea, whichever American League central team doesn't get in, the White Sox or Twins, send them to the National League and let them be the Wild Card in the National League playoffs. Ain't it funny how that works? The New York Yankees miss the playoffs for the first time in 13 seasons, and former skipper Joe Torre is leading the L.A. Dodgers into the National League playoffs. Sure the acquisitions of Manny Ramirez, Greg Maddux, and Casey Blake helped, but the Yanks made some deadline moves tooright? So bringing in a backup, over the hill, catcher in Pudge Rodriguez and signing Richie Sexon off a scrap heap aren't the right moves? With the Red Sox castoff, Manny Ramirez, hitting nearly .400 since his arrival in Chavez Ravine, the L.A. Dodgers offense has become in a word, dangerous. For a team who leads the National League in ERA, it was important for them to bring in offense, and what better way than to bring in a future hall of famer in Ramirez. About that pitching staff, in the month of September, Dodgers starter Derek Lowe, has gone 3-0 in four starts with an era of less than 1.00. Fellow starter, Chad Billingsley, has allowed less than 3 runs in three of his last four starts. Torre's first appearence in the National League postseason may not be an enjoyable one, but at least he won't be on vacation yet, unlike some other American League franchises who wear pinstripes! Is this THE year? Michael Phelps tears through the Olympics, the Celtics finally raise 'Banner 17', Tiger Woods' performance at the Torrey Pines, Federer v. Nadal at Wimbledon, and the GREATEST upset in Super Bowl history by the New York Giants. All will be topped, if the Chicago Cubs win their first World Series in over 100 years. You think Boston did it right in 2004? You ain't seen nothing yet. IF, and I realize that it is a very big IF, the Chicago Cubs are able to capture a World Series Championship, imagine Boston '04 times about five. These fans have been talking billy goats, black cats, and Steve Bartman for as long as I can remember. What they need to start talking about is Kerry Wood and his 33 saves in 39 opportunities, how about Ryan Dempster, his sub 3.00 era and 17 wins, or maybe they could look to their National League best team batting average of .278 through September 24th. A Cubs lineup that has five hitters with 20+ home runs, including all-stars Derrek Lee and Aramis Ramirez. The Cubs will have home field advantage throughout the National League playoffs at a place where they are 55-26. Kerry Wood, a starter that became a closer, who has battled more setbacks in his career than Robert Downey Jr., who had more promise than River Phoenix, finally bringing a World Series to a town that hasn't seen one in over 100 seasons. The embattled Lou Piniella, finally adding a World Series title to his extensive managerial resume. Bigger story than that? Maybe you haven't been paying attention to the stretch run because of all the football going on, I can't hate on that, but get ready because this October promises to be a good one. Welcome to the NFC Beast! Week 3 Picks; Keep It Real! 10 Plus: Take it to the bank!